Lenfald LC9 - Heroes of War! By order of Highlord Triphian I, any city with the skilled artisans required shall erect beautiful statues of stone to commemorate those who gave their lives for our great motherland! Build a statue commemorating the victorious dead of Lenfald. It can include a pedestal, or be placed straight on the ground. You are encouraged to present it in an actual setting, such as a town square or great hall. - The baseplate of your creation may be no larger than 24x24. - The emphasis of this challenge is within the statue itself. While placing it in a nice setting is encouraged, you will be judged mainly on the statue. - As always, quality over quantity. Big does not necessarily mean best! - Post your MOC in the "MOC forum", then post a thumbnail here with a link. Do NOT send me a PM with a link. -Entering this challenge will earn you 2 points! -The Winner receives an additional 4 points! -The Honorable mention receives an additional 2 Points! I know some people may be frustrated at another small challenge, but I think that we had tremendous success with this past one, and I feel that we should still avoid the old standbys of construction and Conflict at least until LC10. Frisky this is an awesome challenge! These smaller builds work well in between the big events. I'm stoked to build for this one! Huge congratulations on the well-deserved win, it's a really great MOC. Keep it if you can afford the Lego and space, it's well worth it. And congrats to Andared as well! Have fun with LC9, guys, looks like another great LC. I'm afraid I have to back out of this one as I have a huge US Civil War MOC I must build for Brickfair VA and it won't be ready if I don't "git 'er done!" Congratulations soccerkid and Andared! I like the smaller challenges as well. I'm going to try to participate in the LC 10, but my involvement (MOC building) will be extremely limited for a long time. Tomorrow (Wednesday) they are putting my wife in the hospital and our son will be born on Thursday. I will be involved in the forums and posting, but MOCs will be extremely limited (I do still plan to build on the LC 10). Anyways, good luck men, and good building! Congratulations to Soccerkid and Andered This LC looks great! Congratulations, you two! Well-deserved placing, your builds both conveyed returning from war very well. Also, great idea for the LC, Frisky. I've never really delved into brick-built statues before, so this is going to be interesting. Thanks for the positive feedback guy! Now get building. . I'm taking a trip to the Lego store tomorrow to nab some parts off the PAB wall, then I will get started on my entry. Also I wanted to propose a new system for selecting judges. If I were to judge every contest, I wouldn't get a chance to build, and the same applies to AV. I also don't want to be hunting down people who are willing to judge How about if the winners of each contest judge the next one, For example, soccerkid and Andered would judge LC10. I would send the judges of every contest a score sheet so that they can efficiently judge according to whatever criteria is in the contest. Would everyone be okay with this system? If not, I can continue judging, but I'd rather not. friskywhiskers wrote: Thanks for the positive feedback guy! Now get building. . 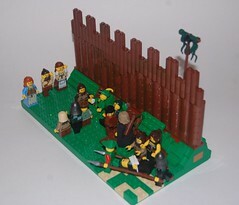 I'm taking a trip to the Lego store tomorrow to nab some parts off the PAB wall, then I will get started on my entry. I'm also fine with the system of winners hosting the next challenge, though I do feel like that's not always the best solution. Since, in theory, by removing the two winners from the next challenge, you end up lowering the standards for the next contest. While it's not always true (for instance, I placed second in LC9 and I'm nowhere near the 2nd best builder in this faction ), odds are that you'll end up with less "quality" winning MOCs since people won't have to work as hard to top the more experienced/skilled builders in this faction, if those experienced builders are having to judge the contest, and thus cannot enter. My only thought is that perhaps we could get people from different factions to judge our contests, and we could do the same for them (if they wanted to). That way everyone from a given faction gets to participate in a challenge. friskywhiskers wrote: How about if the winners of each contest judge the next one, For example, soccerkid and Andered would judge LC10. That is a really great idea. Especially, because different builders are able to ein Every time. If these two are not building for this LC, we could start right now. Or if they want to build for this LC, we could start new judging at the next LC. The other idea of judging between factions is also good. I would participate in this, if someone would judge our LCs. Thanks for the feedback, guys. I will look into external judges but for the time being, we will let Anderad and soccerkid judge this contest. I will send you two the score sheet later today. Also, it is a good idea to have previous winners judge the next contest.